LATEST NEWS: Click here to read an article explaining Increased Fines from OSHA for Non-Compliance. In addition to spill containment, we also provide customers with a complete line of safety equipment and other supplies for the battery room. Our collection of battery related products includes Battery Cleaning Kits, Terminal Covers, and Battery Lifts. 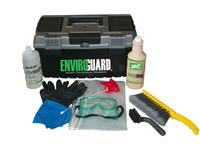 Protective covers are vital to meet requirements set forth by OSHA in publication 29 CFR and also by NFPA 70E. This document explains the hazards faced by personnel in the battery room and what you need to implement to become compliant to avoid an incident in the battery room. Accidental electrical shock may cause severe injury or even death that could result in costly fines and litigation. Refer to our Regulatory Section for information on links to OSHA's Injury Tracking Application. Keep personnel at a safe distance from accidental contact with energized components in the battery room. Be in compliance with NFPA 70E and OSHA 29 CFR. Battery systems over 50 volts require covers. Safety during maintenance from falling tools or other equipment. Protection from unseen energized overhead buswork. Provide extra protection from visitors or entry from visitors or untrained persons. Satisfy your safety policy and show corporate responsibility for employee safety. 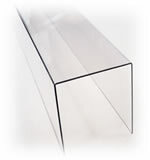 Produced in 4’ length clear polycarbonate in .060” thickness to be able to see terminals clearly. Flammability Ratings: Standard 0.060 and Deluxe 0.111 thickness meets the UL94HB standard. *Non-stocked item requires additional lead time. Also available in custom sizes and congurations. Ships with protective removable film. Note: Size verification using a product sample and customer verification is required prior to order acceptance. Produced in 4’ length polypropylene which are standard with top holes every 12 inches to allow for taking top readings to validate the monitoring measurements. The covers are square to accommodate fast-on tabs that prevent stress points in connected wires and notches at the bottom to accommodate wire clearance. Battery Protective Covers protect personnel from dangerous battery voltage while in the battery room. This product is a required part of the battery room to be in compliance with NFPA 70E and OSHA 29 CFR. A custom shroud that is placed over an inter-tier or end point termination of a battery string. Termination plates come in various sizes to accommodate the various cable and lug sizes as well as the number of cables on each plate. A Custom shield, with or without ventilation holes, that covers a large area such as at the end of rack or front access rack. This product provides a large barrier that is placed in front of an area that may contain a single large energized part or multiple energized parts. Could be designed to create a barrier all the way around the battery rack. Loads can be pushed on level surface or tilted back. 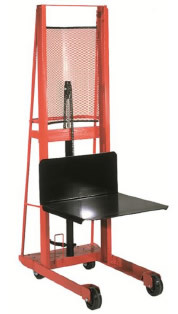 Platform can be hydraulically lifted up to 68" and lowered to 5.75" from the floor. Foot-operated locking brake prevents rolling. Supports loads up to 500 lbs.